Thermaduct™ offers industry solutions to outdoor ductwork that exceed the ASHRAE and ICC Energy Codes present today and those 10 years from now. Our outdoor ductwork is available in the following insulation values. Thermaduct™ is available in 3 select colors. These have been carefully tested for UV Stability, Durability, and Low Thermal Transfer. If you would like to compare our Tan and Gray vinyl to our standard White, ask your local Thermaduct™ Representative for a sample of our vinyl selections today! Thermaduct™ is unique in the pre-insulated duct systems market in that it uses no tapes or adhesives when assembling pieces. Thermaduct’s vinyl cladding is heat or chemically welded together for an airtight seam that can't be matched with tapes or adhesives. Joints are connected with a gasketed 4 bolt flanging system and covered with Thermaduct's joint covers for extra protection from the elements. Cladding for ductwork in outdoor environments is necessary for the long term durability in any installation. As the barrier to rain, wind, snow and hail it is vitally important for maintaining the R-value of pre-insulated ductwork. Thermaduct™ uses a 1000 micron titanium infused vinyl cladding to provide the toughest outdoor ductwork on the market. No tearing, denting or peeling means you keep the outdoor out. Thermaduct™ uses high quality closed cell phenolic duct to achieve some of the highest R-values available in the industry. Closed cell phenolic foam does not allow water to pass through, as can be the case with open cell phenolic foams. Pairing a strong, water resistant interior insulation with Thermaduct's exterior strength provides an unmatched product in outdoor environments. 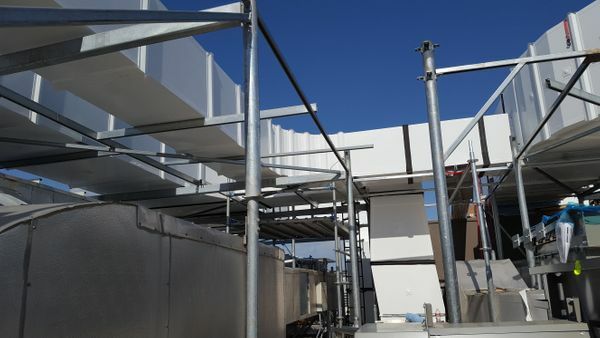 Thermaduct™ is a factory assembled air distribution system that employs a smooth aluminum surface that has frictional characteristics, much like that of galvanized sheet metal. 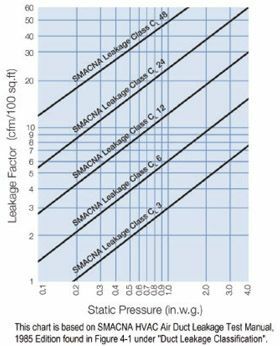 As a result, the frictional pressure drop data for galvanized sheet metal ductwork can be applied when designing and specifying Thermaduct™ air distribution systems. It is recommended that the application of Thermaduct™ supplied be utilized for operation as a supply, return, fresh air and exhaust air ductwork applications for heating, ventilation, and air conditioning applications. Thermaduct™ can be designed to withstand up to a continuous maximum static pressure of 6 inches water guage / 1500 pa and is designed to have less than a SMACNA Air-Leakage Class 1 duct with the Thermaduct™ connection system. By combining two layers of an autohesively bonded aluminum foil vapor barrier to the inner and outer closed cell Kooltherm insulation core, all protected with 1000 micron UV stable vinyl clad with welded or cohesively bonded seams, you simply can’t find a more air or water-tight outdoor duct system anywhere. For general inquiries, you can also reach us at info@thermaduct.com. To order please download the submittal form and email to: info@thermaduct.com.